Dave Feldman is a software engineer who discovered for himself the benefits of a ketogenic diet in April 2015, experiencing what he describes as “seven blissful months” - until getting some labs back that included a 300+ total cholesterol. He learned he was a “hyper-responder,” which inspired him to learn all he could about cholesterol and the lipid system. For the last 2.5 years he’s been using self-experimentation methods to meticulously adjust dietary macronutrient ratios in order to manipulate his blood chemistry. He’s found out that the lipid system is actually quite easy to change, and does so in surprising ways related to diet. 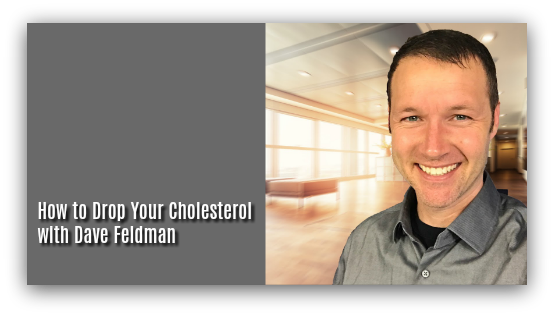 Dave is here today with Dr. Tommy Wood to share his discoveries about all things cholesterol: LDL, HDL, VLDL, lean-mass hyper-responders, and what you need to know to evaluate your own labs. Dave is an active speaker and blogger, and his N=1 experiments are detailed on his blog at cholesterolcode.com. [00:00:19] Video from Low Carb Breckenridge 2017: Dave Feldman: The Dynamic Influence of a High Fat Diet on Cholesterol Variability. [00:02:46] Changing fat intake to manipulate cholesterol levels. [00:05:27] Reverse engineering cellular energy. [00:09:37] Very low-density lipoprotein (VLDL), triglycerides. [00:10:00] Metabolic syndrome, insulin resistance. [00:10:29] Intermediate density lipoprotein (IDL). [00:14:35] Hydrolysis of fatty acids. [00:17:11] 3-day average, LDL-C, LDL-P.
[00:19:05] Nuclear magnetic resonance spectroscopy (NMR), Friedewald equation. [00:21:00] Direct vs Calculated LDL-C.
[00:34:59] Hypothyroidism, T3, testosterone, creatinine. [00:37:08] Dave’s interview with Ken Sikaris on Low Carb Conversations podcast. [00:38:15] Study: Fulks, Michael, Robert L. Stout, and Vera F. Dolan. "Association of cholesterol, LDL, HDL, cholesterol/HDL and triglyceride with all-cause mortality in life insurance applicants." J Insur Med 41.4 (2009): 244-53. [00:44:44] 99% of the LDL particle lifespan. [00:50:23] Cyrex Array 2 - Intestinal Antigenic Permeability Screen. [00:52:15] Study: Varbo, Anette, Jacob J. Freiberg, and Børge G. Nordestgaard. "Extreme nonfasting remnant cholesterol vs extreme LDL cholesterol as contributors to cardiovascular disease and all-cause mortality in 90000 individuals from the general population." Clinical chemistry 61.3 (2015): 533-543. [00:51:38] Peter Attia, Thomas Dayspring. [01:00:38] Low Carb Breckenridge, Low Carb Cruise, Ketocon, Ketofest, @DaveKeto.